More and more companies are choosing to go to wineries and vineyards for a variety of gatherings. We have earned a reputation for providing team building options for companies across the country. We've worked for over half the Fortune 500 and now bring our options to serve corporate events being held at wineries and vineyards. GROUP MIND WORKSHOPS: Creating a group mind helps employees to learn how to support each other and be on the same page. The goal isn't to make every employee the same as every other one, but instead the goal is to have the employees able to see things from each other's perspectives and work together. SKILLS WORKSHOPS: We provide a variety of workshops that can focus on a variety of skills. From Presentation Skills, Leadership, Emotional Intelligence, Sales to Conflict Resolution, Safety and HR Concerns, we can focus and just about any aspect of the workplace that you need to develop. 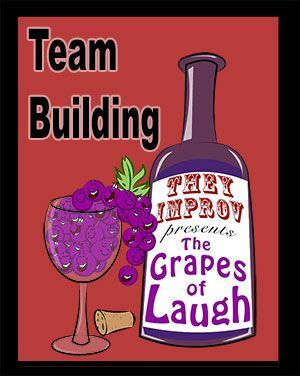 IMPROV COMEDY WORKSHOPS: If you are looking more for bonding and laughter, or even the opportunity to have managers to perform comedy in front of the rank-and-file, we can provide training your group to perform improv comedy in front of one another. It's fun, it's a blast, and we make it easy and solvable. SCAVENGER HUNTS: For groups looking for more of an activity while able to see more around the property, we have scavenger hunts that can help them find things while getting to know the area. We can add team building exercises along the way that make it into more of an Amazing Race kind of event. MINI-OLYMPIADS: We can divide your group into teams and set up a variety of activities that challenge them physically, mentally, or require teamwork. They rotate through the activities with one team at each activity at any given moment. Our staff totals up points and awards the winning team.